Darkness Falls: Take Shelter's protagonist (Michael Shannon) is plagued by premonitions of an apocalyptic storm — and doubts about his own sanity. Madness In The Mirror: Natalie Portman's Black Swan ballerina is another relatively recent example of a main character whose unsteady perspective is designed to keep the audience guessing. In the space of a few weeks, Hollywood will give us four serious dramas about mentally unstable characters. It's a minitrend at best, and most likely coincidental. But it got me thinking about how filmmakers use narrative form to shake up audiences and put them in the same frame of mind as the characters they're watching. Curtis (Michael Shannon), a construction worker in Take Shelter, is worried he might be losing his mind. He has premonitions of violent storms, of rain as thick and brown as motor oil. At work, he sees flocks of birds soaring in patterns strange enough that he suspects he's becoming delusional. He suspects, but isn't sure — and through some deft directorial sleight of hand, his confusion becomes our confusion, providing suspense and jangling nerves right up to the final fade. Curtis is hardly the only anxious character at the multiplex. Ellen Barkin's latest picture, S- - - Year, casts her as a famous actress possibly consumed by delusions. In Martha Marcy May Marlene, Elizabeth Olsen's teenager may or may not have the multiple personalities those many names suggest, but she definitely has so little sense of self that she's losing her grip on reality. 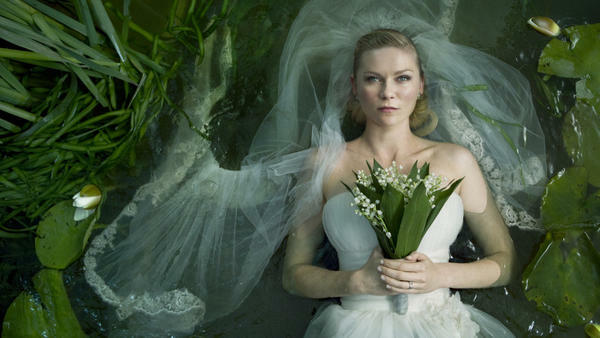 And Melancholia, the film that won Kirsten Dunst a Best Actress award at this year's Cannes Film Festival, is centrally about depression — a melancholia, in this case, big enough to swallow an entire planet. What these movies have in common is narratives that often feel as fractured as their characters' sense of reality. Their directors mess with imagery — and time, and story structure — to throw audiences off balance, to make our nerve endings as raw as those of the characters. This current crop of neurotics joins an asylum's worth of troubled Tinseltowners we've been asked to identify with — the disturbed ballerina in Black Swan, the schizophrenic mathematician in A Beautiful Mind, the giant-rabbit-obsessed teenager in Donnie Darko — all the way back to Jimmy Stewart's acrophobic private investigator in Vertigo. Hitchcock experimented on occasion with splintering narrative to put you inside the head of a disoriented character, but there's now a whole extended cinematic vocabulary directors can play with: leaps in time and mood communicated by skewed camera angles, shifting sound quality, the alternating of black-and-white with color. In Memento, which added a few devices to that list, a guy who can't form short-term memories is at the center of a story the filmmakers tell backward — so the audience will be as clueless when the protagonist meets someone as he is. Not every filmmaker decides to shred the plot when a main character's synapses are misfiring. Think One Flew Over the Cuckoo's Nest or King of Hearts — comparatively conventional portraits of neurotics, though the inmates of the asylum prove saner than their keepers. Or The Madness Of King George, in which audiences are asked to share the distress of the royal court as its monarch deteriorates. Those films, of course, spring from an assumption that stable is normal — that feeling uneasy is not. What's intriguing about this month's pictures is that they seem to spring from a sense that anxiety is the new normal, that there are reasons for characters — characters who aren't in horror films, mind you — to feel threatened and disoriented: the economy, job loss, political uncertainty and, yes, mental illness. So the characters do exactly what you want them to do. They're proactive. They see therapists. They try to work through issues. And does that help? In Melancholia, Kirsten Dunst plays a severely depressed woman who understands precisely how out of step she is. She recognizes her delusions — that forest of vines tugging at her wedding dress, for instance — as delusional. Doesn't mean she's wrong, though. She's been saying most of her life that the world is going to hell. Through her eyes, and then through our own, we see that it is. In the space of just a few weeks, Hollywood will give us four serious dramas about mentally unstable characters. This mini trend is probably coincidental, but our critic Bob Mondello says it got him thinking about narrative form. BOB MONDELLO, BYLINE: Curtis, a construction worker in the drama "Take Shelter," is worried that he might be losing his mind. He has premonitions of violent storms, of rain as thick and brown as motor oil. At work, he sees flocks of birds soaring in strange patterns. MONDELLO: Curtis is aware he might be delusional. But that doesn't really help. He can never quite be sure what's real and what isn't. And in "Take Shelter," neither can the audience, unless the director cues us by, say, having Curtis wake up abruptly. MONDELLO: Michael Shannon's Curtis is hardly the only anxious character at the multiplex. Ellen Barkin's latest picture casts her as a famous actress consumed by delusions. Elizabeth Olsen's teenager in "Martha Marcy May Marlene" does not have the multiple personalities those many names suggest, but she does have so little sense of self that she's losing her grip on reality. And the film that won Kirsten Dunst a Best Actress Award at the Cannes Film Festival, "Melancholia," is centrally about depression. MONDELLO: "Melancholia," in this case, is big enough to swallow an entire planet. What these characters have in common is narratives that often feel as fractured as their own sense of reality. Their directors mess with imagery and time and story structure to throw the audience off balance, to make our nerve endings as raw as those of the characters. MONDELLO: This current crop of neurotics joins an asylum's worth of troubled Tinseltowners we've been asked to identify with: the disturbed ballerina in "Black Swan," the schizophrenic mathematician in "A Beautiful Mind," the giant rabbit-obsessed teenager in "Donnie Darko," all the way back to Jimmy Stewart's acrophobic private investigator in "Vertigo." MONDELLO: Hitchcock experimented on occasion with splintering narrative to put you inside the head of a disoriented character. But there's now a whole cinematic vocabulary directors can play with: leaps in time and mood communicated by skewed camera angles, shifting sound quality, the alternating of black-and-white with color. In "Memento," which used all those devices and more, a guy who can't form short-term memories has his story told backwards, so the audience will be as clueless when he meets someone as he is. MONDELLO: Not every filmmaker decides to shred the plot when a main character's synapses start misfiring. Think "One Flew Over the Cuckoo's Nest" or "King of Hearts," comparatively conventional portraits of neurosis, where the inmates of the asylum prove saner than their keepers. Or "The Madness Of King George," where audiences are asked to share the distress of the royal court as its monarch deteriorates. Those films, of course, spring from an assumption that stable is normal, that feeling uneasy is not. What's intriguing about this month's pictures is that they seem to spring from a sense that anxiety is the new normal, that there are reasons for characters who are not in horror films to feel threatened and disoriented: the economy, job loss, political uncertainty and, yes, mental illness. So the characters do exactly what you want them to do. They see therapists. They try to work through their issues. And does that help? In "Melancholia," Kirsten Dunst plays a severely depressed woman who understands precisely how out of step she is. She recognizes her delusions - a forest of vines, say, tugging at her wedding dress - as delusional. Doesn't mean she's wrong, though. She's been saying most of her life that the world is going to hell. And through her eyes, and then through our own, we see that it is.